Product #21914 | SKU LUC2-07 | 0.0 (no ratings yet) Thanks for your rating! The Night Ize L.E.D. 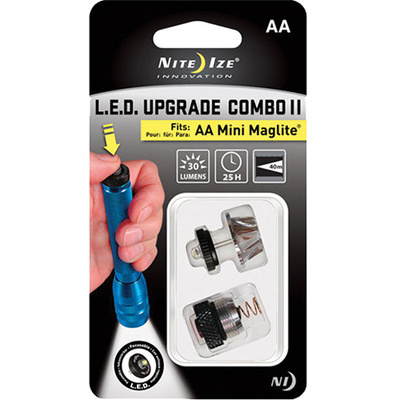 Combo Upgrade Kit II replaces the incandescent bulb of a AA Mini Maglite flashlight with a bright 30 lumens white beam LED bulb. This provides higher quality, more powerful illumination, and longer burn times. Installation is as easy as replacing the incandescent bulb in your flashlight. The long-life LED bulb is shockproof, and virtually never needs replacing. It is also much more efficient; increasing your battery life by a factor of five, giving you a 25 hour burn time. Because the L.E.D. Upgrade II is fully focusable, you can adjust the beam from wide flood to narrow focus, according to the light you need for the task at hand. The tail cap on/off switch will allow your light to be easier to turn on and off, instead of the two-handed on/off twist that is standard on the Mini Maglites.